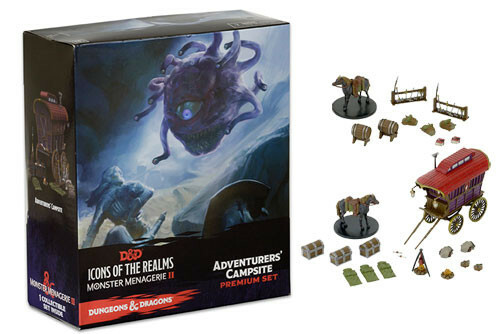 This fantastic pre-painted promotional set contains a variety of pieces to bring your adventure to life along with all the miniatures in Monster Menagerie 2. The perfect setting for your next adventure and a beautiful display piece as well! I love this set. It should make my random encounters more lively. First off: WOW! This is the premium set I've been waiting for. I was so happy Miniature Market was able to get this item restocked after selling out earlier. Every sculpt met my expectations. The paint job is good, too. Retail sellers could overcharge me and I'd still buy this set. In fact, I bought two of these for more horses, bedrolls, and campfires. One of my horse's rear legs were malformed by the plastic packaging, but I was able to bend and reshape it properly. I bought this as i wanted the horses more than anything else but the wagon broke quickly, super glue and a different angle it hasnt broken again, yet. Over all i wish the horses were sold as singles as im forced to buy it again for two horses or search ebay. Neat but some parts are fragile. The lights on the front of the wagon are prone to bending and breakage. The horse's legs were a mess and attempting to straighten causes them to brake off the bases. Easy to fix but at the price it should not be necessary. Big broken piece of nope. Wagon was broken before even opening the box. I make it clear to my gaming group that only I can touch it on account of how fragile it is. Especially given the price. I've been having a lot of fun with this for my PCs and, more recently, while DMing. Even without the horses or wagon, the other items are useful for settings. You must be careful dealing with the horses and wagon as they're easy to break. Mine came in great condition, but I broke a horse foot as I was removing it from its plastic casing. I purchased this for about $71 on this site (as of this review it's current price is $80). It's pricey, but considering this is an incentive promo, I'm glad I could get it without needing to buy a whole brick first. Very brittle and easy to break. Broken pieces just in the box. Hard to believe there is so little in this set for the cost.